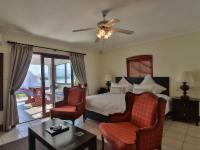 Located on the 2nd floor, these spacious rooms have fabulous direct sea views and private balconies. En suite bathroom (shower/bath), queen-sized bed, air conditioning, ceiling fan, flat screen TV/DSTV, sitting area, fridge, wall-safe, tea/coffee. Extra-large rooms sleeping up to 4. 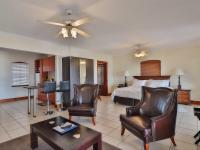 Located on the 1st floor with direct sea views and private balconies. En suite bathroom (shower/bath), queen + twin beds, air conditioning, ceiling fan, flat screen TV/DSTV, sitting area, fridge, wall-safe, tea/coffee. 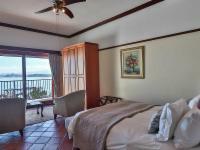 The largest suite is on the very top of the guesthouse with a 360 degree view, huge covered patio, king-sized bed, en suite bathroom with bath and shower, flat screen TV with selected DSTV channels, air conditioning, kitchenette and braai. The junior penthouse suite is on the very top of the guesthouse with a 360 degree view, large covered patio, king-sized bed, en suite bathroom with bath and shower, flat screen TV with selected DSTV channels, air conditioning, kitchenette and braai. If cancelling 7 days before arrival, forfeit 50% of the booking total. If cancelling 14 days before arrival, forfeit 37.5% of the booking total. If cancelling 30 days before arrival, forfeit 25% of the booking total. Check-in between 14:00 and 18:00. Later check-in by prior arrangement only. Check-out by 10:30. We are a non-smoking establishment.